Praise the heavens, because we have a great article for you! Some people might find it strange for a church to have a website, but we’ve found that churches, and other religious organizations, are some of the best customers when it comes to WordPress themes. These churches require communication with their congregations, and that includes event calendars, homilies, priest information, and much more. A church is similar to a little company, with people who interact with each other and organize events on a daily and weekly basis. That’s why it’s so important for churches to get on the internet because the churchgoers are interested in this information. Although some might think of church, as a place to go for worship, it’s far more than that. It’s a place to connect with other people and generate conversation. Luckily, websites help with that! And what better way to build a website than with a WordPress theme? Quite a few premium companies sell WordPress themes for churches. 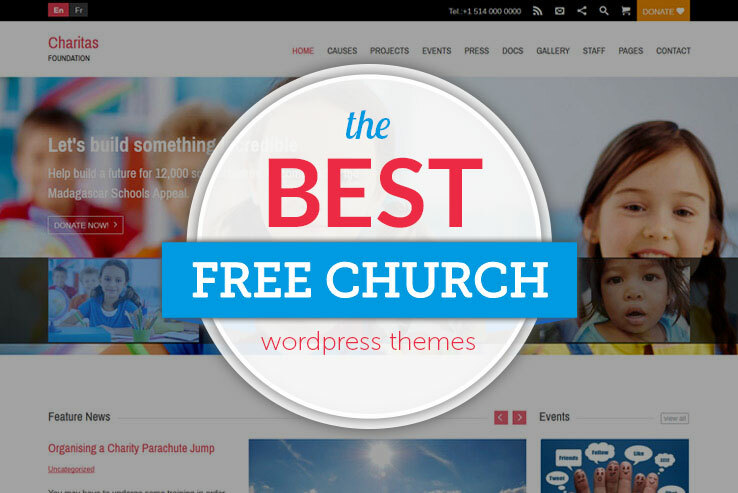 For this article, we’re focusing on the free church WordPress themes. This way, churches don’t have to spend any money to have an online presence. When seeking out a church theme, we recommend finding one that supports all types of media. This way, your church can share items like church sermon audio clips. Also, church websites require event calendars and informational pages for priests. Who (Besides Churches) Can Benefit from These Themes? Churches are the obvious organizations that are going to look at these themes. However, many other religious organizations and non-profits can benefit from the themes. For example, we recommend some of the following themes for non-profits that help the poor and disenfranchised. You’ll also notice that some of the themes can be utilized by just about any religious group, whether it be Jewish, Catholic, Muslim, or any other faith. Finally, churches and organizations generally go for free themes when they are trying to save a buck or two. What’s great is that most churches only need a simple, free theme. The market for church themes is surprisingly large, so feel free to share any thoughts you may have on the themes we talk about below. If you’ve stumbled upon some other free church themes that others might enjoy, share the links in the comments section. 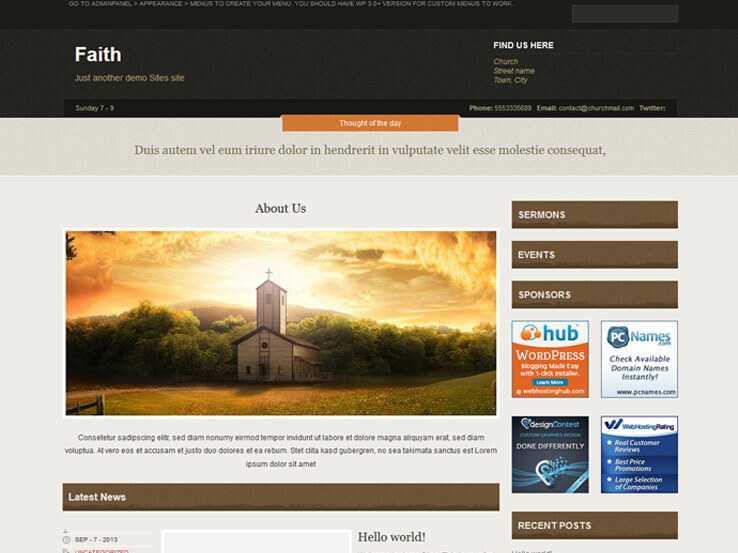 The Church WordPress theme is completely free and quite useful for those running churches or charities. The responsive HTML theme has a large footer widget area, allowing you to implement several widgets, maybe for sermons or sharing your most recent blog posts. The built-in WordPress customizer helps those who would like to create content quickly, while the custom colors give you a certain amount of control over the church site branding. Some of the other custom modules include footers, menus, and CSS. The CSS area opens up more opportunities for advanced developers, considering you may want to change around elements with custom coding. The theme integrates with WooCommerce for selling products and collecting contributions. It also had a custom background to present a warm welcome to people who might be interested in your church. Along with featured images, a responsive layout, threaded comments, and translation tools, the Church theme is a good place to start for any religious organization. 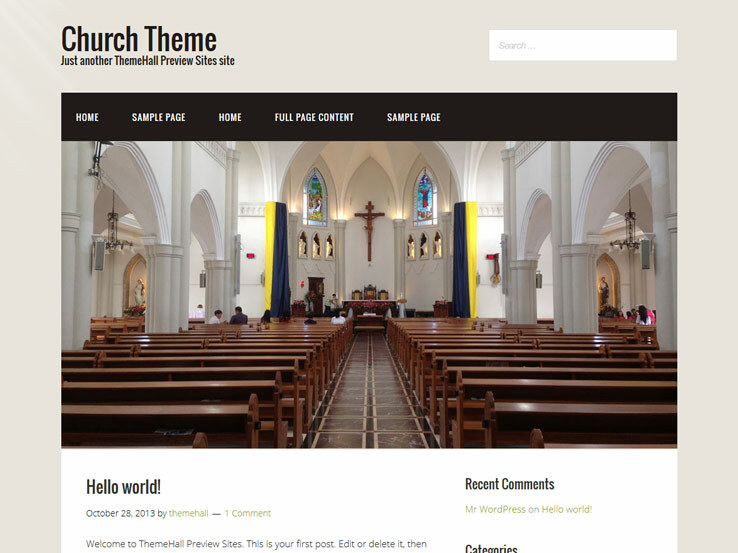 The Versatile WordPress theme is built just for churches and religious organizations, and it provides a button on the homepage to guide people to your location. We like that the theme is adaptive, and it’s nice that you gain access to an unlimited color scheme. This way, if your church has green colors in the logo, you can incorporate similar colors throughout the website. The homepage slider can feature pictures from your services, and the logo uploader only takes a second to use. The primary feature that comes along with the Versatile theme is the upcoming events list. Every church has consistent services, so visitors and regular followers need a schedule to know when the services are. Churches are also known for holding community events such as pancake breakfasts and festivals, all of which can go on the events page to keep people updated. Finally, the Versatile theme is widget-ready for expanding the site, and the media section allows for posting audio and video from sermons. The Faith theme has a decent number of downloads, making it one of the more popular church options. The whole point of the theme is to ensure that churches have all of the pages required, right out of the box. Therefore, you’ll find pages for short messages, events, and sermons. This way, a church director can go onto the website and make changes without any trouble. In addition, the developer doesn’t have to be a coding wizard to launch a church-themed site. The theme provides an area to list service times, which is actually separate from the events area, making it more focused on when people can come into the church and worship. The theme developer mentions that someone could potentially use the theme for a regular blog. All they would have to do is disable all of the homepage extensions that cater to churches. Banner ads are possible, and the custom post types and menus bring about a beautiful user interface for all churches. We like the Zion WordPress theme for a wide variety of reasons. First of all, the theme looks professional and spiritual, providing a calming effect for when people land on your page and want to learn more about the church. The theme only has four different color schemes, but this is a good start for branding and making your church look a little unique compared to the thousands of other churches in the world. 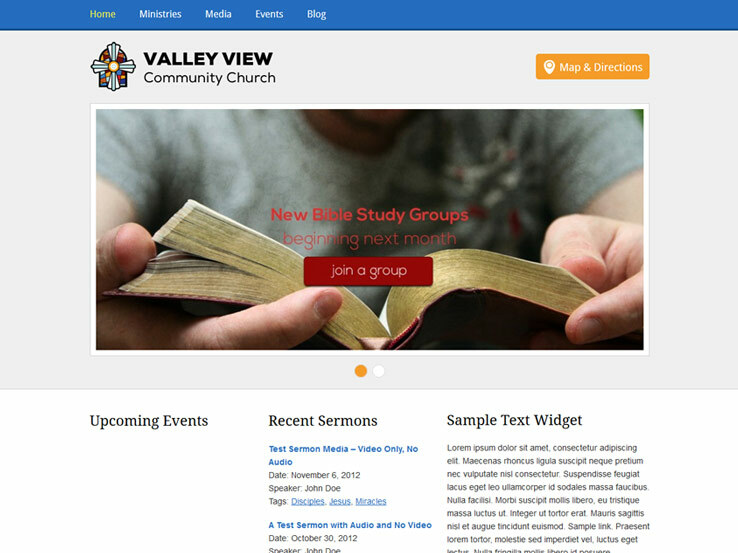 The responsive theme has a homepage slider, which uploads images for churchgoers to see things like event announcements and scheduling changes. Feel free to upload your logo, and utilize the events list to explain dates and times of certain church functions. The media section is a standout feature since it presents a simple way for priests and other religious officials to share items like sermons and speeches. These can be posted as audio or video clips, making it much easier for people at home to watch sermons, or even to re-watch them after they attend a service. The Malaka WordPress theme handles everything from sliders to service information, presenting the details of these services and letting developers upload large banner images towards the top of the website. You will create your Events with the help of a built-in events tool. We like the events module for those churches that hold community functions on a regular basis. This way you don’t have to worry about whether or not the people in your community know about the events or not. Oh yeah, and the events are easy to post and take down, cutting down on constant development time. Save sermons as PDFs, audio files, or videos, all of which can be shared multiple times and taken down from the site whenever needed. There’s even a Bible quote row for greeting your followers and providing a little bit of knowledge or inspiration. The custom styling comes in the form of colors, fonts, and placements. By this, we mean that you can instantly modify something like a color or typography element, all without needing to spend any time with coding or plugins. 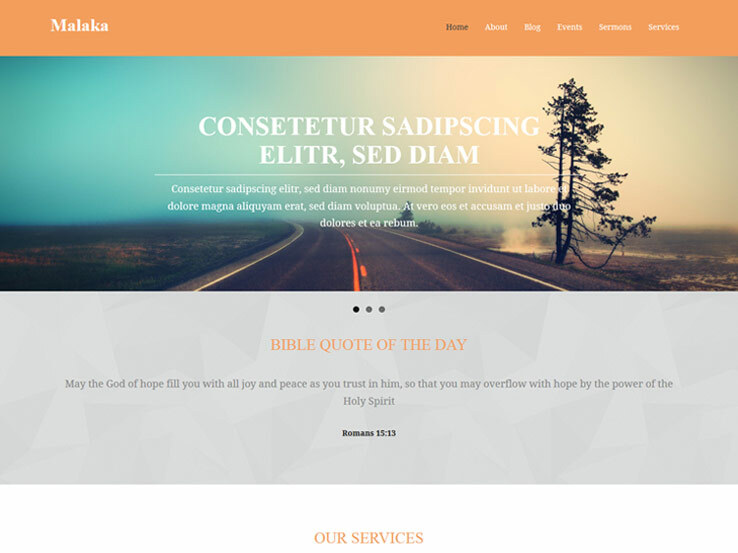 Overall, the Malaka theme stands out with a pleasant design and simple features. 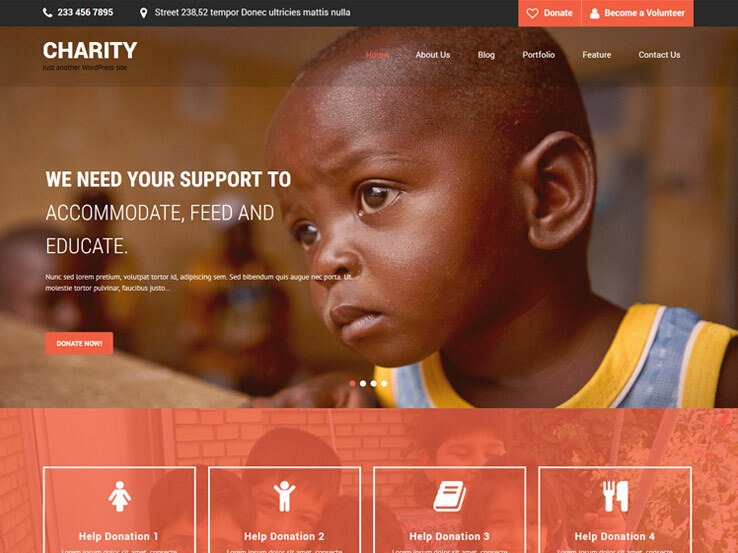 The SKT Charity WordPress theme works nicely for churches and charity organizations. We mainly like it for those companies or non-profits trying to collect money for a certain cause. For example, you may want to ask people to contribute for children with a sickness or families of veterans. The theme connects with WooCommerce, and a beautiful Donate button resides on the homepage for users to stop by and make their donations. All of the contributions are then sent through a payment gateway and into a bank account. The Contact Form 7 plugin also integrates with the SKT Charity theme, presenting an uncomplicated form for people to contact the charity or church. The NextGen Gallery is yet another useful plugin to consider. Overall, this gallery plugin launches a stunning photo gallery for when you’d like to take and share shots of the church, charity, or events that make money for the charity. Finally, this is an entirely responsive theme for viewing on mobile devices, and it looks more akin to a premium theme than one you don’t have to pay a dime for. 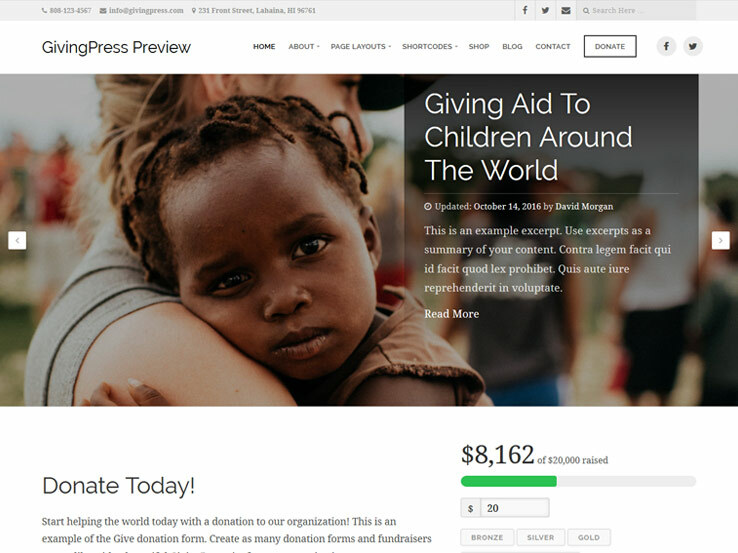 The GivingPress theme has a system for collecting donations, along with a clean design with plenty of calming white space. We like it for charitable companies, seeing as how the three column format and beautiful typography is certain to look more professional and convince folks to make donations. It’s also nice to see translation tools since you might be getting donations from all over the world. 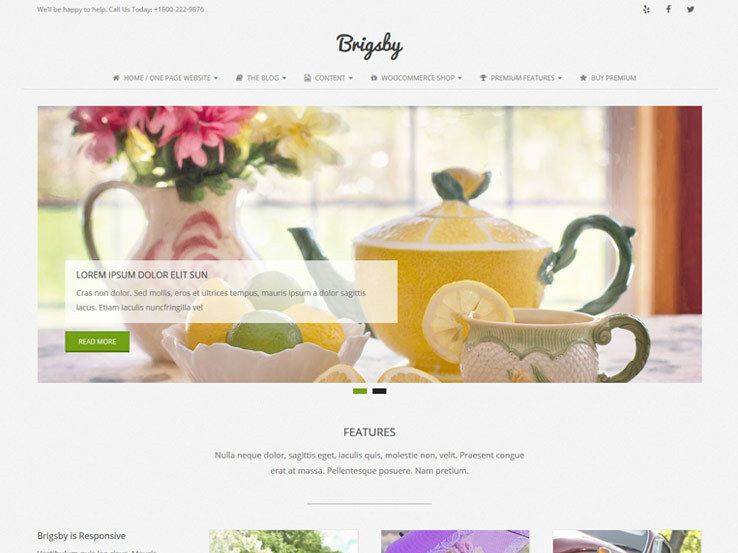 Brigsby is a cool and refreshing free WordPress theme that works well for churches and non-profits. It features a large beautiful slider that’s great for sharing your church photos on the homepage and ample white space so visitors can focus on your content. Internet users on mobile phones and tablets are catered for with a responsive layout that adapts seamlessly to any device and screen size. The Brigsby template also includes eCommerce integration for selling merchandise and collecting contributions, Google Maps support, and a contact form for your followers to easily reach out. Charitas Lite is a nice option for non-profit organizations, charities, churches and foundations who want a clean and modern look and feel to their website. The homepage features a large full-width banner that’s perfect for displaying a welcoming photo of your church and links to your blog posts and other parts of your site. Charitas is designed to be simple and clean. Your website will load fast and look beautiful on smartphones and tablets as well. Use the template to build a professional-looking site to connect with your congregation, raise funds, and much more. 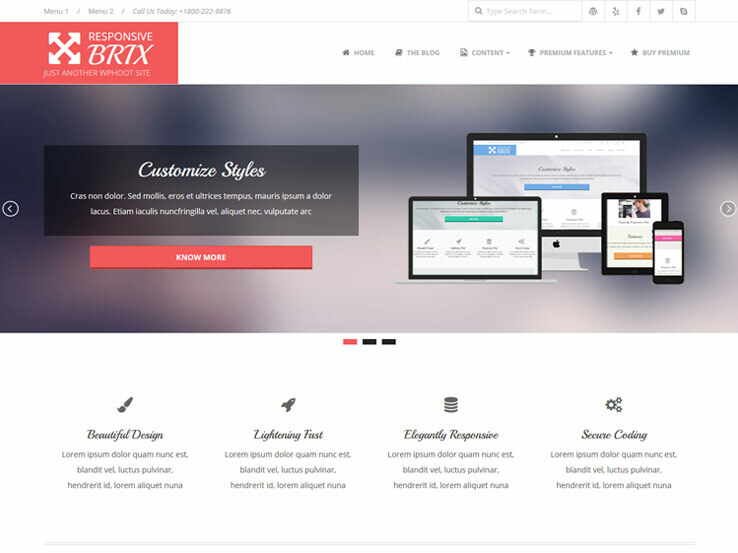 Responsive Brix is an elegant fast loading WordPress theme that you can use for your church website. 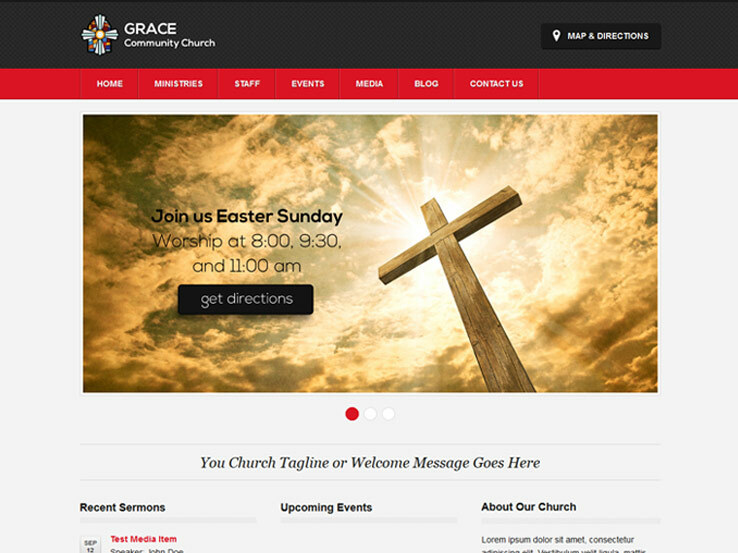 It brings a beautiful design along with a wide range of features such as the attractive slider for highlighting your church photos or messages, color options to give you more control in branding your website, and a responsive design so that your site can work correctly on mobile phones and tablets. The Responsive Brix theme is translation-ready, which gives you the ability to connect with people in different languages. And in case you get stuck with the template, the developer provides support to help you.